Metal Gear Solid: Rising can be completed without killing any humans, allowing players to disarm, wound, and intimidate their foes. Metal Gear Solid: Rising is a major departure for the long-running Metal Gear series. Past entries have focused on stealth, with players spending a majority of their time crawling through darkened corridors and hiding under boxes. 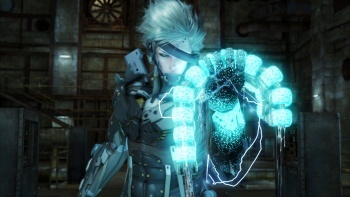 Rising, which stars the ninja cyborg Raiden, is a much faster, more action-packed game. With gameplay focused on motion-controlled swordplay, Rising is potentially a far more violent game as well. Still, Rising will retain one thing in common with past Metal Gear Solid games - despite the focus on slicing and dicing, you won't have to kill a single human. Rising producer Shigenobu Matsuyama told Kotaku that "You could actually have a no-kill completion [in Rising]. There will be a lot of mechs and cyborgs, but if you slice them up, that will be considered as a no-kill as well. You'll have the freedom of killing humans, of course, but you can proceed through the game without killing a human being, but slicing up mechs and cyborgs." Offering your enemies mercy won't convince them to stop trying to kill you. Still, while pacifism will force you to sneak around a bit more, you aren't exactly helpless. You can disarm opponents with your sword, cut away their ammo, or even inflict minor wounds. Enemies that are sufficiently intimidated by these actions will run away. Players should be careful with their sword, Matsuyama noted, "You could maybe accidentally cut human enemies. I would like to add the expression of the pain [that enemies feel]... not just make a slice 'em up, dice 'em up." While Matsuyama doesn't necessarily want to induce feelings of guilt, he does want players witnessing these expressions of pain - grimacing, screaming, and the like - to consider the moral weight of their actions. He added, "I want to emphasize that I will never reward a player for killing human beings in the game. I won't make it easier to clear the game [that way]. I will probably make it more difficult." Regardless of how you feel about the moral issue, giving players the option of not killing their foes is a rare allowance for the action genre. It will be interesting to see how swinging to either extreme - pacifism or torture - will change the overall gameplay experience.